Are you ready for Black Friday?? | Nan Tubre Writes . . .
Are you ready for Black Friday?? Ya know, you just have to respect anyone who will formulate a plan of attack, secure the necessary means (by that, I mean credit card ;-D), then get up that early to fight the masses all in the name of a good sale! Hey, I’m down wit you on that. But personally, I have never ‘done’ Black Friday, Saturday, or Monday. I just can’t do it. Too many people. Simple as that. I don’t mind getting up early, certainly I’ve done that before. I love a good sale, that is what I’m all about. In fact, my husband says my middle name is ‘Clearence’, lol. And I’ve been known to extol the convenience of credit cards and the wisdom of having a good attack plan. But I just can’t hang with all those people. 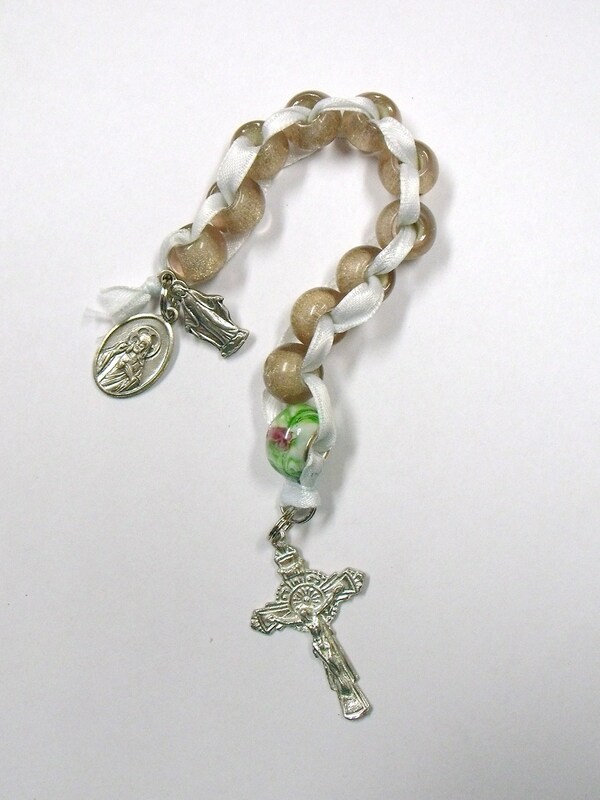 This is a little pocket rosary I put together with a new mother (or grandmother) in mind. Some people call it a St. Theresa rosary. Some people call it “Count your blessings” prayer beads. 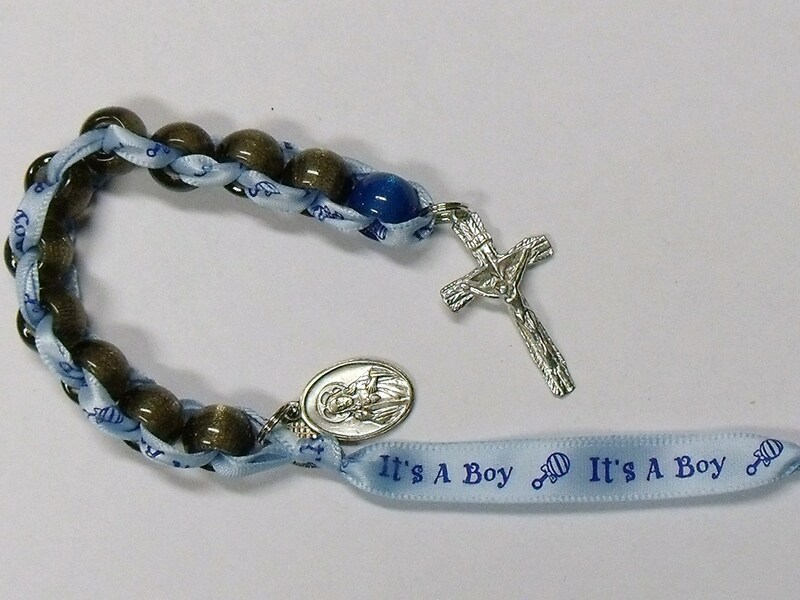 It has 10 smokey glass foil beads (Ava beads) and one blue glass foil bead (Our Father). To pray with them start at the blue bead, say your prayer and then move the bead up. Follow with all the other beads. The beads easily slide along the ribbon. One end features a silver crucifix and the other end has a silvertone medal with the Sacred Heart of Jesus on one side and Our Lady of Mt. Carmel on the other, plus a guardian angel charm. This makes a really sweet gift. I can just picture a new mother rocking her baby boy to sleep as she prays using this sacramental. I can make it in “It’s a Girl” pink too. I also offer some for any other occasion as well. For the next one, I used white ribbon with a beautiful green and pink flower lampwork bead and 10 pale glass foil beads. It also has a silver crucifix and silver tone medal as well as a Mary charm. I have added some new Car Bracelets, too. You remember those, don’t you? They hang from your rearview mirror, ie; a bracelet. Or you can call it a Car Rosary. That’s what it is to me. This one is approx. 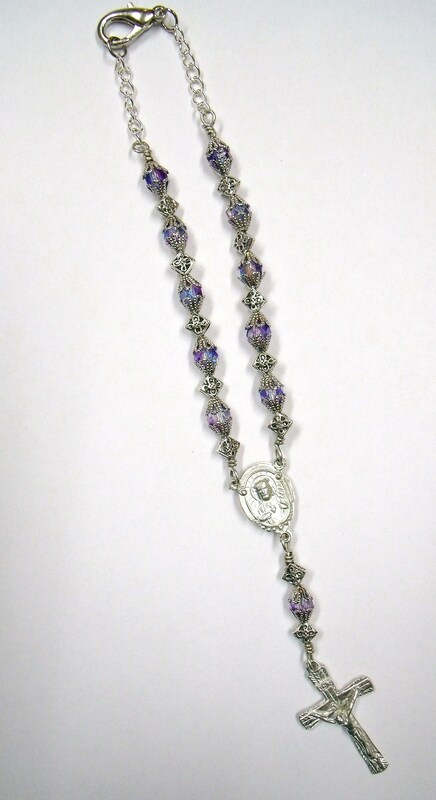 8 inches long from the clasp to end of the crucifix. The beads are light purple with an aurora borealis finish and are capped with silver tone bead caps separated by diamond shaped metal spacers. The Sacred Heart center and the crucifix are silver. The sunlight will glimmer off that AB finish on these beads! 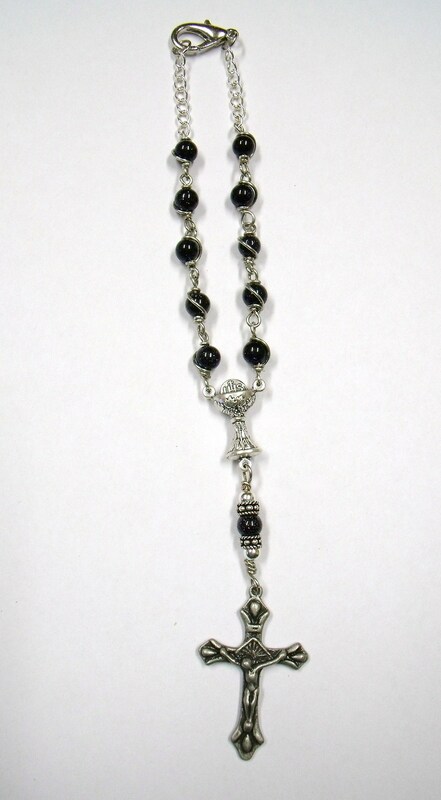 This 7 inch car rosary has a little simpler design. 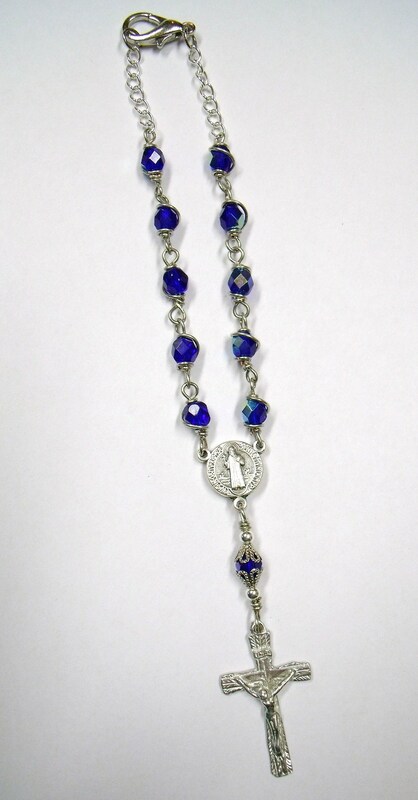 It has deep blue ava beads and a silver tone St. Benedict center with a silver crucifix. It, too, has an aurora borealis finish to the beads and each one is individually hand wrapped with silver plated wire. OMGosh, I love love love this one! These beads are called goldstone. They look black but are really an incredibly dark blue. Instead of gold flecks as the name would suggest, they sparkle with silver like star dust! So beautiful! It also features a Holy Communion center and is just over 7 inches long. And as always, if you like what you see here, got to my etsy shop and – well – shop! www.etsy.com/shop/nanaspocket Don’t foget to snag the coupon I mentioned at the beginning of this post! « There’s Somethin Snazzy going on here! I’m not much for fighting the crowds either:) It’s so convenient that we can stay home and shop!